It would ve great to have the :port and :channel in the make-omn function. Sometimes is interesting for hearing snippets with different sounds without having to compile the entire score (sometimes it take a while,depending on the complexity of the score). The port would help to deal with vst adresses and libraries on auditioning. Best ! Thank you, Torsten ! Looks great. Have a nice 2019 ! Just a quick question about make-omn: is it possible to add to the parameters the notation with num? I am currently analyzing Webern's opus 29 following a question I was asked. If I add the notation in integers I get this: (ds4 num3 b4 num11 d4 num2 cs4 num1 f4 num5 e4 num4 g4 num7 fs4 num6 as4 num10 a4 num9 c4 num0 gs4 num8)) but this notation mod12 is not taken in count in make-omn, is it possible to add the notation in integers in the parameters (length, pitch, velocity, articulation, etc.) of make-omn? with num? Thank you for your reply, but that's not what I want. 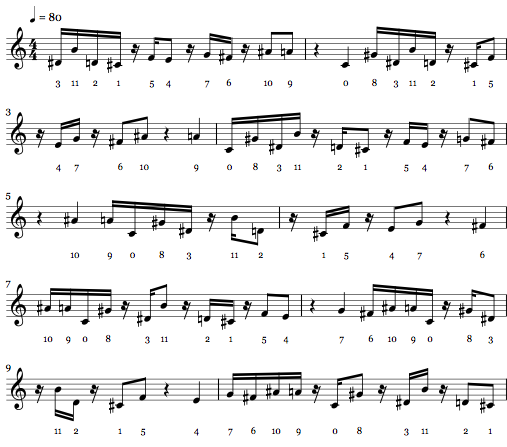 I know the integer-to-pitch function well, I use it in my musical analysis with the tools of the Set Theory. And precisely, at my request, in order to be able to add the notation mod12 on a partition, Janusz created the insertion of integers via num0 ... num11. What I want is for make-omn to recognize the num parameter, either directly or by being able to add to :length, :pitch, :articulation, :velocity, the parameter :num or other name. Réponses croisées. Merci. Je n'avais pas pensé à l'intégrer en tant qu'articulation. Merci donc. Et je viens de vérifier en ajoutant aussi des articulations (num0+marc, num11+stacc...) ça fonctionne. C'est impeccable. Cross responses. Thank you. I had not thought of integrating it as an articulation. Thank you so. And I just checked by adding also joints (num0 + marc, num11 + stacc ...) it works. It's impeccable. I have some idea how we could do that - possibly next week. Sorry for the delay of the answer but I finalized a project with a baroque flutist around the tale of Andersen "The Nightingale and the Emperor of China" and whose music was written with OPMO. 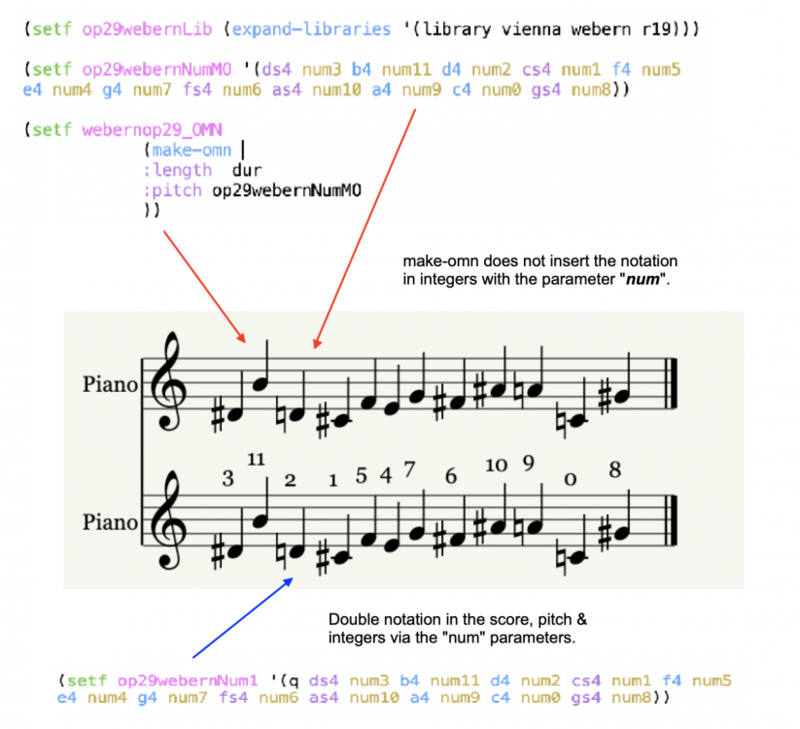 Indeed, the association of notation in integers with the option: text is useful. Nice to hear from you. Congrats for the project. I'm happy to make something useful here.